Our Epsilon Rohloff is the first Fully with a Rohloff hub and Gates Carbon Drive drive. Due to the use of a drive rocker and state-of-the-art suspension technology, there are no drive effects on the Epsilon. Belt tension is achieved by sliding and finely adjustable dropouts. The Epsilon is made of a high-quality lightweight AL7005 triple tube set. The bearing point of the rear axle revolves around two large deep groove ball bearings, which run on a stable 20mm bearing axle. The Epsilon can of course also be equipped with a chain drive. The weight of the frame, including suspension, is 2750 g; complete bikes are around 13kg depending on the equipment. 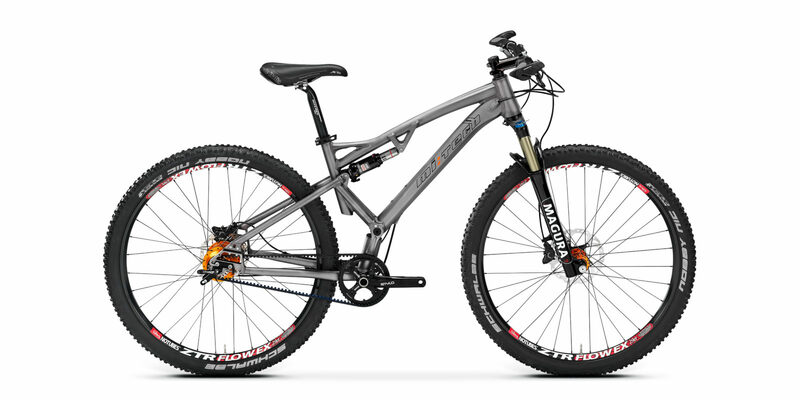 Also available as 26” and 650B version as well as a 28” trekking bike.